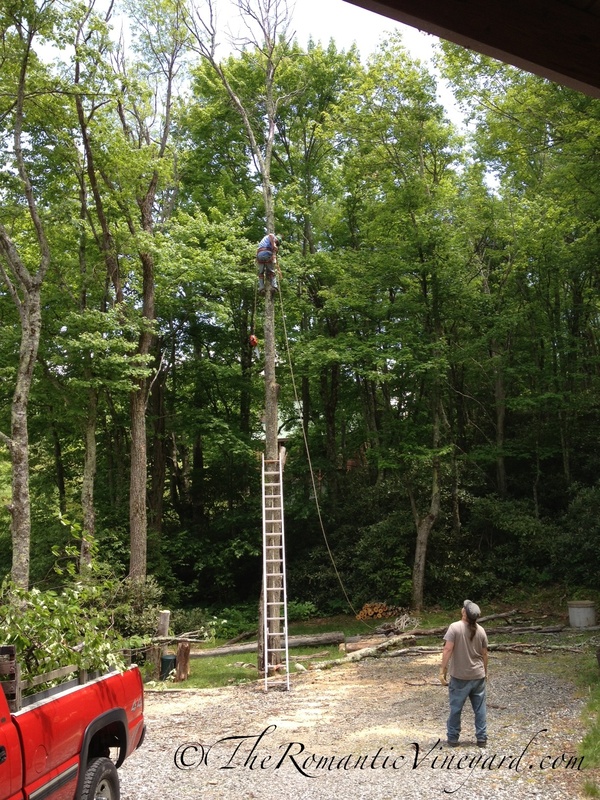 When we bought Barefoot Cabin we knew upfront there were several things that needed to be done to make the property safer–like cutting down the 9 dead trees surrounding the cabin. It was sad to see these sentinels that used to be alive and well, standing before us bare, dead and dry. But they were, and they needed to go. The same needs to happen from time to time in our marriage. We can hold onto things that should be discarded, but we’re often too sentimental to let go. Most marriages have one who tends to be more sentimental and subjective while the other spouse tends to be more logical and objective. Both provide a necessary balance in the relationship, especially when there are changes that need to take place. I’m the sentimental one. I can become strongly attached to people, places and things. Take our first home…we lived there for 12 years. We had our three children in that home. Many memories were made there as well as great neighbors we hated to leave. But it was time. God had spoken to us that there was another neighborhood where He wanted us to put down roots. We put our home on the market, and it sold quickly. So quickly, in fact, that we weren’t sure if we would be able to buy a home in the neighborhood we had hoped, because there weren’t any homes on the market at the time. Long story short, a home in this new neighborhood went on the market two weeks before we were closing on our first home. I was away on a ladies retreat in NC, so Tom went to see the house without me. He took a good friend of mine to get the female perspective. Without me seeing it, Tom put an offer on it, it was accepted, and we closed two weeks later. That was in 1992, and we’re still there. As happy and excited I was to have a new home, I was heart-broken at having to say good-bye to our old home. I knew the memories I was leaving behind, but I had no idea of the new memories to come. I had to let go (or cut this old tree down) before a new one could be planted. I realized how weak my faith was. It was easier to trust God when I could see the tree standing. Not knowing what the new tree would look like left me with lots of questions: Will I like the new neighborhood? Will the children that live there be a good influence on my children? Will we be able to afford the unknown expenses? Etc. Change always provides new opportunities to grow in our faith and trust in God. If nothing ever changes, then we won’t grow. This is why God allows us to go through changes, why He allows trees to die. Once the dead is removed our view changes as well. What was once hidden by the tall trees is now clearly seen. What dead trees have been removed from your relationship? How have you handled the changes. Are you the subjective one or the more objective one? How has this difference brought conflict or balance to your marriage? This entry was posted in Christian Marriage, Growing Strong Marriages, Seasons of Life and tagged Change in Marriage, Dead trees, Gardens, God, Home and Garden, Neighbourhood, Objective vs. Subjective, Plants, Sentimental, Tree. Bookmark the permalink. Thanks for that message. I needed to hear it.